Wearables​ may​ look​ adorable,​ but​ are​ they​ producing​ usable​ and​ beneficial​ health​ data? People measure how many steps they take because it makes them feel healthy, like they're doing something proactive for the body and mind. But can that measurement—the actual number itself—make people healthier? Or is it just another lifestyle metric dressed up like a medically actionable data point? Right now, the answer is a little bit of both. While millions of people are busy strapping Fitbits, Apple Watches and other fitness trackers to their wrists and moving until they feel the Pavlovian vibration of reaching 10,000 steps, others are using dedicated at-home medical devices such as connected glucose meters and weight scales. Clinicians, meanwhile, are busy trying to figure out how to turn those steps and blood-sugar readings and weights into meaningful tools to keep their patients healthy. The tools might also allow doctors to make better decisions for their patients during those stretches of time between appointments, with at-home monitoring serving as a benevolent, health-oriented surveillance system that sends alerts when certain thresholds are crossed. The industry is working to make sense of the data patients are collecting from wearables. "You can't really get sustained, effective behavior change at any level just by doing periodic, episodic office visits," said Dr. Joe Kvedar, vice president of Partners HealthCare's Connected Health. "This is a very important part of healthcare delivery, and it's just starting to come into focus." The key is culling information from raw data, making sense of a slew of numbers that, on their own and without context, are just consumer-oriented lifestyle metrics. While getting the numbers is easy, making them worthwhile is another matter. "Patient-generated data really needs to be processed and made very user-friendly," said Dr. Eric Topol, director of the Scripps Translational Science Institute. To do that, a few providers, optimistic about the promise of at-home gadgets, are turning to software made by a handful of companies hoping to transform patient-generated health data into important clinical information that complements the medical-grade measurements providers record when their patients are in the hospital or doctor's office. The question is whether relying on at-home measurements is worth it, or whether providers are better off not forcing new data into their workflows and spending their time elsewhere, among the plethora of data points they already have. 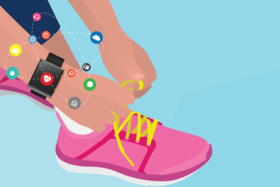 Wearables tap relatively new technology, and it's impossible to talk about the promise of these measurement tools without first discussing the shortcomings of these mostly wrist-mounted devices that rely on accelerometers and tiny sensors to track movement, heart rate and other stats. The first Fitbit device was introduced in 2007. The gadget and others like it have come a long way since then: A recent Stanford study showed that heart rate data from the Apple Watch, Fitbit Surge, Microsoft Band and others all had error rates of under 5% during cycling. But wristbands are limited—and they're still, at their core, lifestyle devices. "There's no magic to this 10,000-step thing," Topol said. "That's completely arbitrary. I don't consider it medical." Where consumer wearables—and fitness trackers in particular—excel is in market share: About one-fifth of Americans have a fitness tracker, according to Gartner. That makes it a convenient means for payers to keep track of their insureds' habits. Insurer Oscar Health, for instance, rewards its members for tracking their steps, and Apple and Aetna recently discussed getting Apple Watches for many Aetna members. "It allows us to engage with not just our sick members, but also our healthy members," said Liz Robau, Oscar Health's product and tech communications manager. "They're opening the app, they're using step-tracking, so they have more familiarity with the other features in our functionality." In other words, Oscar's members become more active participants in their health. That's all well and good, but what would make engagement even more worthwhile is if the measurements themselves led to actions and insights. "The idea behind tracking is that eventually you want it to lead to some sort of result," Robau said. For wearables to be useful, it's not enough for patients to wear them consistently. The data has to be able to move off the device and into EHRs and other systems. "A lot of this consumer-driven data isn't being ingested into the EHR," said Vaughn Kauffman, a partner in Pricewaterhouse- Coopers' Health Industries Advisory practice. Data must be turned into the equivalent of a narrative by software. Some providers are turning to outside companies to help them manage all that data so they can easily access it, make sense of it, and use it to keep their patients healthier during all the time outside of office and hospital visits. In part, providers are responding to patient demand. "Patients are going to have wearable devices," said Rita Bowen, vice president of privacy, compliance and health information management policy for software and services firm MRO, "and they're going to present that data." She then echoed Kauffman's sentiment: "The problem comes from flowing that data into an EHR." While Fitbit offers an application programming interface to bring data into care management dashboards, other companies are pulling data from devices that capture more traditional health-related measurements, such as blood glucose, weight and blood pressure. "Something that could be a driver of a fast growth rate around wearables is that there's a clear reimbursement model" for providers, Kauffman said. But right now, patients are still paying out of pocket for a lot of these devices, he said. Nevertheless, some providers are actually prescribing these devices to their patients. Activity trackers, for instance, can be used in diabetes and obesity treatment, Kvedar said. Once the information is captured, though, it has to become useful. "We control the flow of the data," said Eric Rock, CEO of Vivify Health, a company that pulls data from connected devices, processes the information and integrates it into workflows in EHR systems, with the goal of making the data efficient to use. "This is important to reduce the overall workload, while increasing patient volume and improving outcomes and satisfaction," Rock said. On some EHR systems, for instance, providers can get alerts. When a provider clicks on an alert, he or she sees risk indicators created by algorithmic analysis. "We manage the efficacy of the data, because these clinical programs are gathering the right information at the right time from these devices," Rock said. Hospital systems like Sutter Health are using patient-collected data to try to improve care for Type 2 diabetics as part of an Accenture-led pilot program for the Office of the National Coordinator for Health Information Technology exploring how patient-generated data can be used. The hospital has been tapping technology from digital health company Validic to bring patient-generated health data from a Sutter patient app into its existing EHR system. "Clinicians and care managers could look every day at not just how an individual patient was doing, but also at a risk-stratified patient list," said Validic CEO Drew Schiller. Patients, too, got feedback. Accenture Federal Services will respond to the pilot with a final white paper to guide federal policy on the use of patient-generated health data after the pilot, which ended in September. Some EHR vendors, meanwhile, are giving clinicians an in-EHR view of wearables data by processing the data themselves. EClinicalWorks, for instance, incorporates data from consumer devices, such as weight scales and blood-pressure cuffs. In the future, the platform will include a clinical rules engine that helps physicians manage the influx of data. "That allows physicians to make better decisions during the appointment itself," said eClinicalWorks Vice President Sam Bhat. Indeed, successful use of patient-generated data won't supplant office visits; instead, it will complement them, Kvedar said.